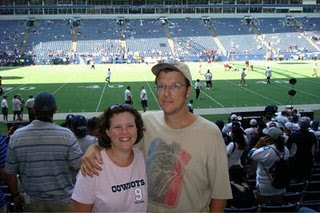 I usually just post about comics, video games, science fiction, and the like, but I liked this picture of my wife and I taken at the Dallas Cowboys' game a week ago Sunday. The Cowboys lost, but we had a great time. We were on the 40-yard line 11 rows up, so we had a good look at Romo, T.O., and the rest of the 'Boys (there were probably some cheerleaders there, too, but I didn't notice).